(CNN) - President Barack Obama's re-election campaign says they're going up Tuesday with a new TV commercial that attacks Mitt Romney for what they say is the Republican challenger's past support of outsourcing jobs overseas. "What a president believes matters. Mitt Romney's companies were pioneers in outsourcing U.S. jobs to low wage companies. He supports tax breaks for companies that ship jobs overseas," says the narrator in the ad. 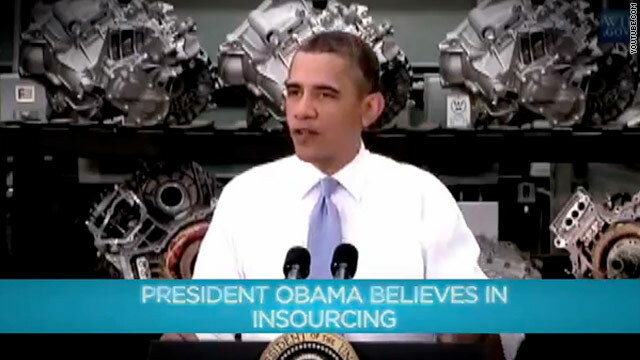 "President Obama believes in insourcing. He fought to save the U.S. auto industry and favors tax cuts for companies that bring jobs home. Outsourcing versus insourcing. It matters." The Obama campaign says the 30-second spot is running on TV in Colorado, Florida, Iowa, North Carolina, New Hampshire, Nevada, Ohio, Pennsylvania, and Virginia, all important swing states that both campaigns will contest in the race for the White House. The ad will run on broadcast and on national cable, including on CNN. The new commercial follows three ads put out last week by the Obama campaign that also attacked the presumptive GOP presidential nominee for outsourcing. The spots came under scrutiny from Romney's campaign, as well as a third party fact checking group. Those ads went up in Iowa, Ohio, and Virginia. The premise in all the commercials pull from a Washington Post story published a week and a half ago that claims Bain Capital, the private equity firm co-founded by Romney, owned companies that were "pioneers" in outsourcing, particularly in low-wage countries such as China and India. Both the president and Vice President Joe Biden have also personally slammed Romney over the report. The first round of outsourcing spots by the Obama campaign came under scrutiny by FactCheck.org, a nonpartisan group affiliated with the Annenberg Public Policy Center, which said that some claims in the spots were untrue, and other assertions only had thin supporting evidence. Their report sparked a war of words between the Obama campaign and FactCheck.org. Romney's campaign pointed to the FactCheck report in responding to the new Obama campaign ads. "The Obama campaign continues to try to mislead voters with ads that independent fact checkers have repeatedly proven to be false," Romney campaign spokeswoman Amanda Henneberg wrote. "We are happy to put Governor Romney's record of job creation in the private sector, and as governor, up against President Obama's any day. Spending millions of dollars on untrue ads won't change the fact that President Obama's policies have left more than 23 million Americans struggling for work." Last week, Romney's campaign pushed back hard on the Washington Post article, saying it failed to draw a distinction between "domestic outsourcing" and "offshoring." Outsourcing, the campaign argued, is a common practice and can occur domestically without sending jobs overseas. Offshoring, on the other hand, involves shifting work out of house and overseas. The bishop can't outrun his job killing machine in the US and sending those jobs to India. Just as he can't outrun bankrupting companies, Americans losing their jobs, retirees losing their pensions and he and his bsin buddies making profits of over 300%!!!!!!! On average PER COMPANY!!!!! Bottom line: M!tt cannot hide from his distructive job-destroyer record at Bain Capital. He basically cannot lean on his record implementing Obam@care in Massachusetts. His campaign may have to change directions and stop failing at representing him as the fake-polar-opposite of the President. No one is buying it – especially in the swing states with highly educated voters who understand our nation's economic issues. The G0P has already pumped huge dollars into this campaign – if they continue on a self-destructive path, its all wasted. They may not have any other option, though, and this may be why many in the G0P did NOT want M!tt as the nominee. If the taxes on businesses were lowered, we wouldn't have to out source. Romney knows how to run a business and country; he showed that by taking advantage of what's offered to us. Out sourcing started way back when and our country gave all our jobs away. Don't blame Romeny.......he's the only smart one in the bunch. Except, during Romney's term as Governor of Mass he offshored/outsourced state jobs held my Mass residents to India. Romney doesn't have a leg to stand on in debating this aspect of his business background. Another example.. a perfect example. Romney pushes even now with America's struggling employment situation to lay off more yet police officers, firefighters and teachers. Which, and he doesn't mention this, would place them onto the unemployment roles and aid in sustaining a far more than needs to be reduced American job growth. Its fine to promote private industry job growth. Obama does also. But you don't feed the virus to cure the cold. Stopping giving corporate welfare to those who have and are taking American jobs overseas would be a heck of a start to curing the cold. Its not that the goods would cost the American household more, its that the expected profits might go back to a reasonable level. As it is now we have so many hands in every pie, at record numbers of new levels, by the time everyone gets their cuts and bonuses there's little left for the actual labor costs. Our system of how many hands does everything have to go through has becomes entirely bloated. Creating jobs in America is an important step towards our economic recovery. I sincerely hope candidates on both sides pressure their SuperPac’s on bringing outsourced jobs back to America. Honestly if every USA company who off-shores jobs to places like the Philippines and India brings back just 10% we would see an immediate impact to our economy. Everyone can start doing their part now. If you receive and/or place a call into a customer services, tech support or a call center, ask the person you are talking with if they are in the USA. If they are not, politely ask for a USA based agent. You may experience some delays or get a supervisor for they are trying to keep the call offshore. Eventually you will get a USA agent and you have successfully done your part. All call centers staff based on call volume daily. When you ask for a USA agent you are building volume to the USA centers therefore these companies will staff to this increased volume within days. Lei’s all do our part by bringing jobs back to America One Call at a Time. Wow even when it has been proven their information is false they still want to godown this road again. Hmmm no wonder is approval rating is so low. I guess the POTUS did not see where GM is going to outsource jobs as well the same GM that he brags about giving loans to save. Yeah their thanks is to outsource jobs. Can anyone say JOKE? Romney...Bain corporate raider who outsourced American jobs overseas. Obama wants to close misguided loopholes & bring the jobs back to America. Outsourcing....Offshoring....BOTH mean American jobs are being shipped overseas because wages are cheaper and corporations dont have to pay ANY benefits....like unemployment insurance..medical/dental..workman's comp, social security/medicare taxes...federal income tax. Both practices hurt American workers and America in general. Mittens is really out of touch with the majority of Americans.....except the wealthy 1%. Another reason Obama will be re-elected in November 2012. Aw, Romney's good at making new jobs - in China. Have you noticed how Mitt Romney doesn't talk about Bain Capital? It is supposed to be his calling card, his biggest credential to be POTUS, but he doesn't talk about it? Why not? Probably because anything he says that might sound good about it would be a lie. Of course it has already been debunked and is a flat out lie, but you will not hear it from the liberally biased media. Just another Obama lie. Remember he said he would not raise taxes (SCHIP, Obozocare) would have the most transparent presidency in history(Eric Holder), and that if we gave a trillion dollars to the dope addicts, welfare frauds and corrupt union bosses unemployment would not go above 8%. Get it folks, HE LIED. Apparently there is no moral balance to his Bain decisions-just will we make money, a lot of money from this decision. That is why he also funded a company dealing with medical waste, included aborted fetuses from hospitals. The man may go to a Mormon church, or whatever, but his real god is MoMoney. I have no idea what he stands for as he has been on both sides of every issue. Is he really a Harvard-educated Eastern elitist liberal? How do you know he isn't as his position changes according to teh group he is addressing. Romney outsourced the jobs and then kept and still keeping all the profits in Switzerland and Cayman Island. What a fake patriot! See if the difference really matters to someone who has lost their job, career, income, etc. to outsourcing. I suspect the distinction really doesn't matter. I would appreciate very much to hear Romney coming up clean and say, he outsourced jobs to India and China and he will not do it anymore, once he is elected president. Two points....outsourcing and off shoring are not the same. A company can outsource work to US other companies..for example, in house IT work. Offshore means sending work to another country. Work that requires direct client contact cannot be offshored. seocond..If the US would change some of the onerous regulations and taxes maybe the work would not be offshored. Lest we forget, President Obama's jobs czar is the CEO of General Electric and one of his biggest campaign contributors. General Electric was to be the benefactor of the cap and trade energy scam just as they shipped tens of thousands of jobs overseas in their aero division, made record profits in 2011 and paid not one red cent in taxes to the US government. Romney the clown even sent state jobs to India as gov.of mass ,what a joke he is and he was involved in bain till 2003 and beyond . The Obama ads bashing Romney and Bain outsourcing have already been disproven, but that won't stop the lies coming out of the Obama campaign. This administration is incapable of telling the truth...on anything.